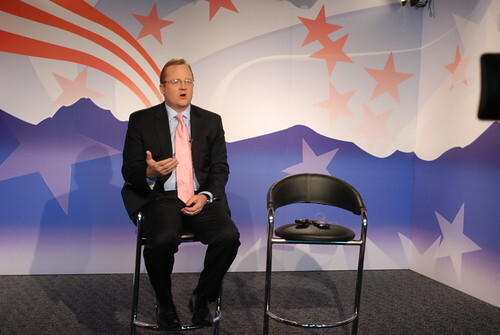 White House press secretary Robert Gibbs became the spokesperson for Obama Administration contempt toward the left on Tuesday. The display of contempt came in the midst of a nearly 70 percent shift in Wall Street executive donations from Democratic candidates to Republican candidates ahead of the November mid-term elections. On Tuesday, The Hill published an interview with Gibbs, who said what Obama has done and is doing would never be "good enough" for the "professional left." Gibbs attacked the left for comparing Obama to George W. Bush, suggested, "these people ought to be drug tested" and said they "wouldn't be satisfied if Dennis Kucinich was president." He also said they would only "be satisfied when [America has] Canadian healthcare and [America has] eliminated the Pentagon." Gibbs' remark revealed a lot about what members of the Obama Administration think of the role of debate and citizen participation in government. And, the implicit apology Gibbs made in the aftermath of his "inartful" comments revealed even more about an administration that believes progressives should take marching orders from this administration or else. "So we should all, me included, stop fighting each other and arguing about our differences on certain policies," he said, and work together "because we've come too far to turn back now," Gibbs said after mentioning he watches a lot of cable television, as if to excuse his remark. While circumstantial, the best evidence for why Gibbs would feel like uttering the aforementioned remarks is the shift of money from Wall Street to Republicans ahead of the election. Obama was the candidate of Wall Street in the 2008 Election garnering nearly $8 million in campaign contributions from securities and investment industries (nearly double what Republican presidential candidate John McCain garnered). The Democrats earned 57 percent of campaign contributions from securities and investment industries. The situation compels the Obama Administration especially White House press secretary Gibbs to whip the left and the sections that are most listened to by voters into line not only because money from business interests needs to swing back the other way but because disappointed and disillusioned voters will likely stay home, not donate to Democratic Party campaigns, not make phone calls, and refuse to go door-to-door canvassing prior to Election Day if they do not fall in line.